This show was broadcast on April 22, 2014. 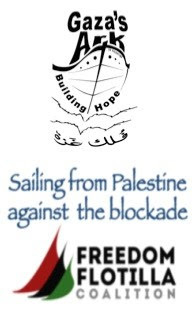 First half hour: Ehab Lotayef wants YOU to help break the blockade of Gaza…by putting in an order for Palestinian products from Gaza’s Ark – a boat being built in Gaza that will soon sail abroad with its hold full of olive oil and other good stuff! Second half hour: I discuss 9/11 with my favorite right-wing Zionist, Barry Chamish – originally recorded last week on Barry’s radio show. This entry was posted on Sunday, April 20th, 2014 at 10:47 am	and is filed under 9/11, Anti-War, Censorship-Propaganda, Concentration Camps, Disaster Capitalism, Econo, Freedom, Justice, Kevin Barrett, News, Occupation, Protest, War Crimes. You can follow any responses to this entry through the RSS 2.0 feed.